This week in the world of cartoons, we are treated to an unusual Marvel/Disney crossover, an Iron Man appearance on Hulk and the Agents of S.M.A.S.H., and a story of Fry traveling through time on Futurama. Ultimate Spider-Man is off for a little while to make way for the new Hulk series and Avengers Assemble is a repeat this week. As always - minor spoilers ahead! Beware the Batman – "Toxic"
Rex Mason makes an appearance this week, with Batman trying to stop Mason's imminent transformation into Metamorpho. 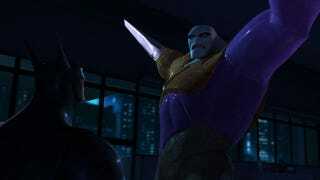 Will Metamorpho be branded as a hero or villain on Beware the Batman? A Two-Face turn on the character might work well. Futurama – "Game of Tones"
The title might suggest a Game of Thrones-inspired episode - especially considering the GoT intro on The Simpsons from last summer. You won't find the Starks on Futurama this week, but we may have something better, as a series of musical tones sends Fry on a journey to 1999 where he meets his family again. For an in-depth look at this week's episode, check out Esther's review. Adventure Time – "Too Old"
Fresh off a break-up with the Flame Princess, Finn accompanies Princess Bubblegum on a diplomatic mission to visit the Earl of Lemongrab. Regular Show – "Steak Me Amadeus"
It's the season finale of Regular Show, and we're closing with some Mordecai and Margaret tension. Looking to go to the next level in their relationship, Mordecai intends to cash in all his "Amadeus Dollars" to buy a nice dinner for two at Steak Me Amadeus. Aqua TV Show Show - "The Dudies"
Aqua Teen Hunger Force returns for the second episode of a new season this Sunday night, under the name of Aqua TV Show Show. Check out the revamped opener at the top and a clip from the new episode above. Update your DVR settings. Phineas & Ferb – "Mission Marvel"
Phineas & Ferb play with one of Disney's largest acquisitions in history - the Marvel Universe. Spider-Man, Thor, Hulk, and Iron Man team-up with Phineas & Ferb to take on the combined villainous forces of Dr. Doofenshmirtz, Red Skull, M.O.D.O.K. (a nice touch), and Venom. Hulk and the Agents of S.M.A.S.H. – "Hulk-Busted"
Iron Man, creator of the Hulk-Buster armor and Marvel figurehead, appears on the show this week after a suit of stolen Hulk-Buster armor attacks the Hulk(s). Top image courtesy of DC Comics and Cartoon Network. Hulk and the Agents of S.M.A.S.H. airs Sunday mornings on DisneyXD. Futurama airs Wednesday night on Comedy Central. Beware the Batman airs Saturday Mornings on Cartoon Network. Watch Aqua Teen.